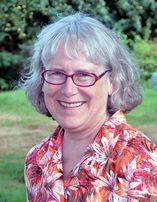 Peg Tillery, WSH&G garden editor and writer, is a retired WSU Kitsap Extension educator. Her specialties include: youth and community gardening, numerous topics on horticulture, native plants, water quality, marine critters and entomology. She is a member of Washington State Nursery and Landscape Association and Garden Writers Association. Peg volunteers for WSU as a Master Gardener, Beach Naturalist, Stream Seward and Native Plant Advisor. She writes a popular column and blog called “Plant Life” for the Kitsap Sun. Bremerton Kitsap Access TV (BKAT) carries her “Kitsap Gardener” program with helpful tips on gardening in maritime climates. Awards include: YWCA Woman of Achievement, WSNLA Educator of the Year and Olympic Koi Club Journalist of the Year.